The former president acknowledged the powerful effect his late wife had on the country in a heartfelt message. Former President George H.W. Bush shared a heartfelt message about his late wife, former first lady Barbara Bush, a day after her passing at the age of 92. "I always knew Barbara was the most beloved woman in the world, and in fact I used to tease her that I had a complex about that fact," Bush, 93, said in a statement shared on Twitter, in which he referred to his wife as "the enforcer," her nickname among family. He acknowledged the many well wishes sent his way, and let everyone know that the Bush family will be all right. "But the truth is the outpouring of love and friendship being directed at The Enforcer is lifting us all up," the statement continued. "We have faith she is in heaven, and we know life will go on — as she would have it. So cross the Bushes off your worry list." Barbara Bush died Tuesday after battling a number of health issues. She served as the country's first lady between 1989 and 1993, while her husband was president. In an earlier statement confirming her death, the former president's office called her a "relentless proponent of family literacy." 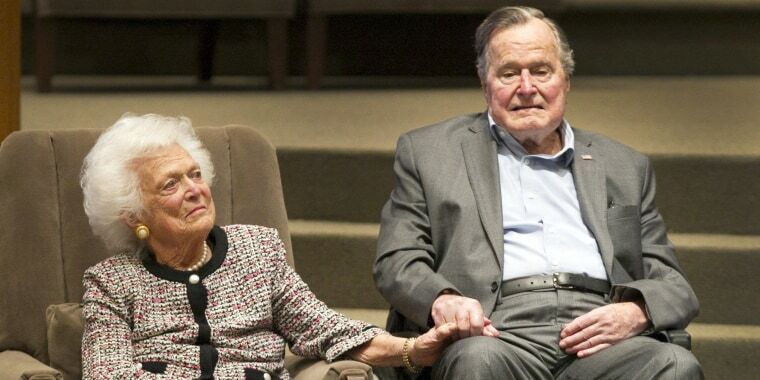 Bush and her husband had been together for more than seven decades after meeting at a school dance in 1941, and became the longest-married couple in presidential history. From love letters to the political dynasty they sparked with the birth of their son George W. Bush, America was fascinated by their remarkable love story. Tributes have poured in since her death, including poignant notes from her own family. "Mom kept us on our toes and kept us laughing until the end," George W. Bush said in a statement. "I'm a lucky man that Barbara Bush was my mother. Our family will miss her dearly, and we thank you all for your prayers and good wishes."